Bear with me folks, I’m going to take one of my rare dips into semi-topical stuff, so if you are reading this in a few days (the Internet equivalent of several decades) then it will seem horribly out of date. 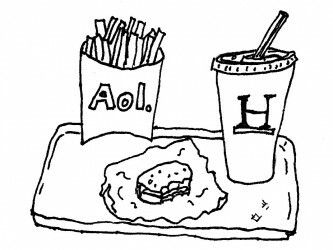 AOL – the one time giant of the ISP industry that somehow managed to shrivel to the point that I’m not sure what exactly it is that they do – has just announced that they will be purchasing the Huffington Post – a blog website so massive that one of the founders now voices a cartoon bear. The purchase bolsters an already substantial roster of information sources, and reveals an interesting capitalistic trend in modern news. Capitalism is a powerful force, and though it seems to be complex, it is actually very simple. Do whatever it takes to make the most money. Build a product as cheaply as possible, using inexpensive materials and speedy, low cost methods, then sell it for as much as people will pay to as many people as possible. It isn’t necessarily a recipe for quality, but it IS a recipe for quantity, and for satisfaction. After all, people will pay more,and buy more, if they are getting what they want. Thus, it pays to provide the people with lots of what they want, and only what they want. You specialize, targeting your product to the market that wants to consume it. The strategy can be applied to virtually anything. Take food, for example. Drive down the main street in my home town and you will see all sorts of fast food chains. You like fried chicken? We’ve got KFC, that’s all they sell. In the mood for Pizza? Papa John’s, Dominoes, or Pizza Hut, take your pick. Burgers on the menu? McDonald’s, Wendy’s, and Burger King will happily sell you some. There are better options with more balanced menus, sure, but if you don’t want to muck around with things you haven’t tried or don’t like, a fast food joint is your best friend. These franchises are capitalism as applied to cuisine. They take the carbs, fat, grease, starch, salt, and sugar that you crave, mix it up in a quick and easy to consume form, and wrap it up in a colorful package and catchy name. Each individual restaurant creates a world where only your chosen snack exists, and they provide it in a refined and streamlined fashion. Does it work? I’ve got four words for you: Billions and Billions Served. So we know that catering to a niche works like gangbusters for food, but can you really apply that technique to news? Well, let’s take a look. Fox News, last I checked, was rocking the slogan “Fair and Balanced”, but at this point the concept is so laughable it would be hackneyed to make a joke about it. They have a clear, obvious republican slant. If you want to live in a world where President Obama is a Kenyan Muslim who wants to kill your grandmother, Fox News will gladly deliver that world ’round the clock. Meanwhile AOL, now that they’ve picked up Huffington Post, is setting up to serve as a strong voice for another camp. Maybe they’ll start to report on the republican conspiracy to outlaw science in schools and mandate religion, while shipping gays off to reeducation camps. Oh, but let’s not forget that news isn’t just politics. There is divisiveness all over, and AOL is well equipped to cover all of the bases. They’ve got Joystiq to stoke the flames of the console wars, and Techcrunch and Engadget will gladly do the same for Apple vs. Android. Bi-partisanism is all well and good, but it just isn’t sensational. It doesn’t hold your attention. And if it isn’t simultaneously exciting and predictable, people won’t keep coming back. So it might take a somewhat… creative interpretation of the facts, but by the end of the day you’ll have all of your pre-judgements comfortably reinforced, and you won’t have had the trouble of having to consider, or even hear, differing viewpoints. Like fast food, it might not be good for you, but it is cheap, quick, and satisfies your cravings while supplying just enough of what your brain needs to keep you from dying. This sounds like a diatribe against capitalism, but it isn’t. With all of its flaws, and its ability to exploit and amplify our own flaws, capitalism still encourages something very important: Choice. It values competition, which means that the other voices will always be there, screaming loud and clear. They just aren’t always being broadcast on the same channel. It is up to you to shop around a little. Life has always required a carefully calibrated BS detector. It is only recently that the need has been made so obvious.